We've Hit 500 "Likes" on Our Facebook Page! We're Having a Giveaway to Celebrate! We've hit a milestone on our Two Crafty Mules Facebook page - we've hit 500 "likes!" To celebrate, we're having a giveaway of a custom made domino pendant with the winner's choice of image. It can be of a friend, family member, saint, or anything else the winner desires. 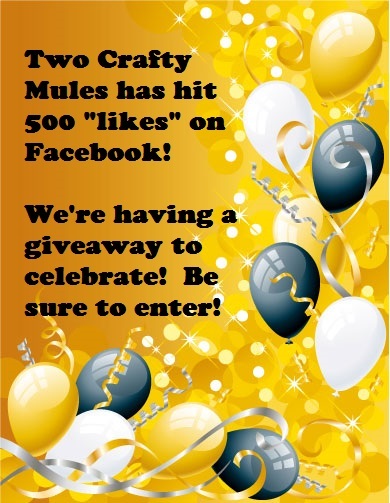 To enter the giveaway, please leave a comment on our Facebook page under the "500 likes" post. A winner will be selected by random number generator next Sunday, May 12, 2012. When we were in Rome, we heard that we should be very careful when visiting Naples (the next stop on our destination) because it had a reputation for being dangerous. We were even told we probably wouldn't like it there. In actuality, Naples ended up being one of our favorite stops on the trip. We stayed at a hotel called Hotel Maison Degas in the historic district of Naples. First, the location is ideal as you are walking distance from many of the sites and shopping areas there. Second, the owners of the hotel - Francesco and Emmaneula - are absolutely wonderful. They were very friendly and accommodating to us during our stay. We felt as though we were visiting with friends when we stayed at their establishment. I highly recommend them if you ever visit Naples. You will not be disappointed. The view of the piazza from our hotel room - Hotel Maison Degas. Naples has some wonderful shopping. There are lots of little winding streets filled with shops and vendors; more than you can possibly visit in a short stay. There are also several street vendors selling their wares. You can bargain with the vendors and walk away with some great deals. Anthony and Brianna checking out produce in Naples. A butcher shop in Naples. Yum! One of my favorite places to shop in Naples is on San Gregorio Armeno. There are hundreds of shops on this little street. This neighborhood is known for their nativity sets (known as "presepe" in Italian.) There are many variations of handmade presepes here, in many different sizes. This is also a good location to find handmade Italian souvenirs. For doll makers, there is a shop that sells various clay and ceramic body parts if you want to make your own creations. During my visit to this area, I watched a shop owner meticulously paint nativity figures. 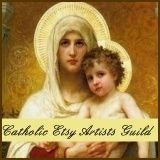 I also found some gorgeous mini Virgin Mary statues which I purchased and will eventually use in 3-D jewelry creations. The shops on San Gregorio Armeno are packed to the gills with goodies for purchase. Hand painting nativity sets - one by one. Doll making parts are available by the thousands. One of the biggest celebrations in Naples occurs on San Gennaro's feast day. San Gennaro is the patron saint of Naples. Most of the shops and businesses are closed that day; most of the city participates in the all-day celebration. Thousands of people crowd into the Duomo Naples Cathedral to watch for the liquefaction of the saint's blood - a tradition which dates back to the 1300's. From there, the crowds filter into the church to view the vial of blood and light candles while praying for the saint's intercession. I was thrilled to be able to participate in this celebration. It was quite beautiful and awe-inspiring to see so many people come together in peace and reverence. The faithful line up to see San Gennaro's relic. A side view in the Duomo of San Gennaro. The faithful light candles asking for the saint's intercession. Naples is known for it's delicious food and handmade, brick oven baked pizza. I have to tell you - we ate pizza many times during our stay here. It was fantastic. Of course, it didn't hurt that a pizza establishment was located right across the street from our hotel. :) In addition, there is some wonderful street food that is too good to pass up. We had some tasty potato croquettes and arancini (fried rice and meat balls) made by Pizzeria Giuliano. They were out of this world! Last, but certainly not least, we also indulged in some handmade pastries that you really can find only in Italy.